The placement of pieces is similar to the standard square-based chess variant, with a few exceptions. 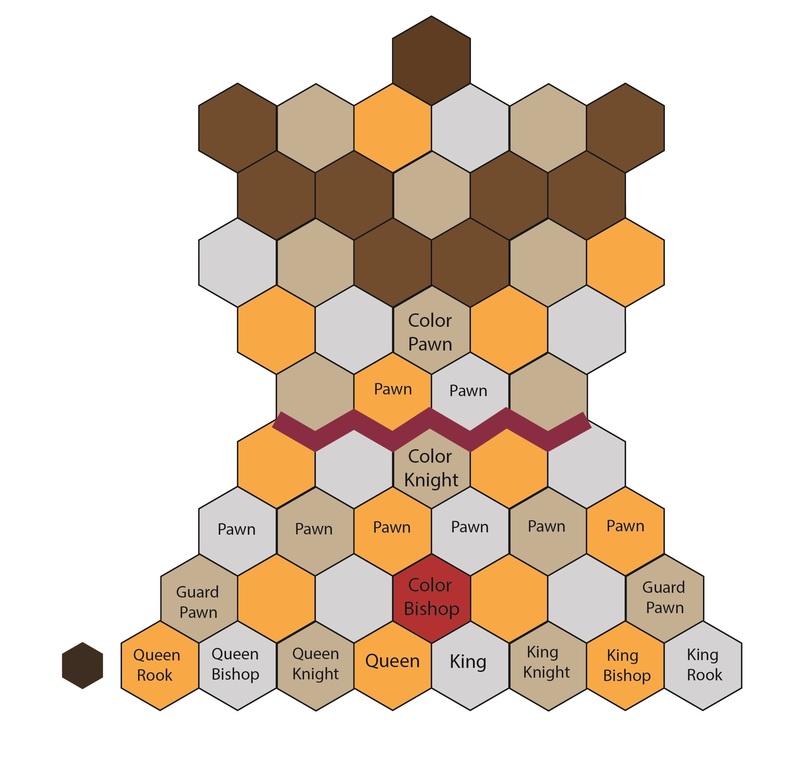 The Queen is always placed four hexagons from the Queen Indicator Hexagons (the small brown hexagons at three of the corners of the board). ImmortalStarMasters has a third bishop (due to the nature of the hexagon matrix) which is placed on the territory's "Color Hexagon" (this "Sovereign Bishop" is the only Bishop which can occupy the center hexagon of the board unless a player opts for another Sovereign Bishop upon promotion of a Pawn). The Sovereign Knight (S - Springer) is placed directly in front of the Sovereign Bishop. The first rank Knights (S - Springer) and Bishops are transposed in relation to the standard chess varient, i.e., the two Bishops on the back ranks are placed next to the two Rooks, and the two Knights (S) are placed between the two Bishops and the King and Queen. A Guard Pawn is placed between each Rook (located in the standard position on the first, or back, rank) and the Rook Pawn on the primary Pawn rank (the third rank). Each Guard Pawn is designated as to King or Queen Guard Pawn. The three pawns in front of the Sovereign Knight and Line of Sovereignty are unique on this board in that they do not possess the ability to make an initial two-space movement. The fact that they may move in any direction other than crossing over their own Line of Sovereignty compensates for this loss.